Hi Peter, just recently I was following a vase that I was bidding on and it went out of sight at least for me, I know you do not discuss value here, but for the record, I thought you would like to know, this vase is 15" tall with a spurious mark, talk to you later, from Stan. 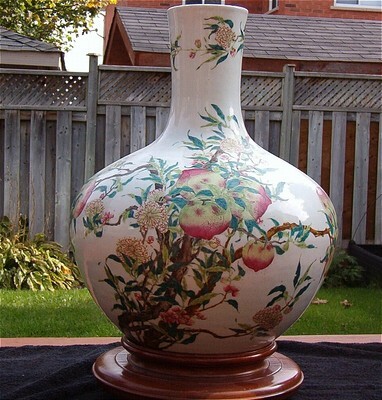 Helo Peter, this vase started out at $9.99 and was listed for 6 days, it sold for a total of $40,200.00 I could not believe it, but other items I have bid on sold of top dollar all late Qing dynasty, in the thousands, whats going on? Stan, as I told you, don`t believe all what you see. Much of what you see sold on Ebay is not necessarily so due to shill bidding. Ebay is not the market for such high price sales, especially as the buyer cannot see the product itself before paying. The risk is too high. I simply don^t believe it, and buyers in that category would buy in more reliable auctions. Stan, most peach vases are fakes. Only imperial items would command that price. 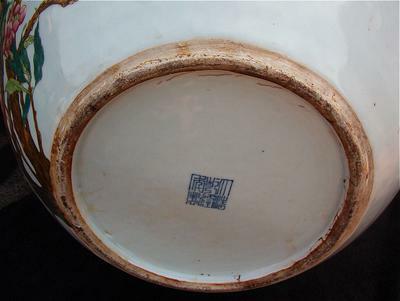 The foot rim seems to have been smeared with something to make it look old, a common technique used by fakers. Always be aware that high price items on ebay are likely fakes and shill bidding may be involved.